Mercato Sonato is a project to requalify an unused market hall in Bologna. 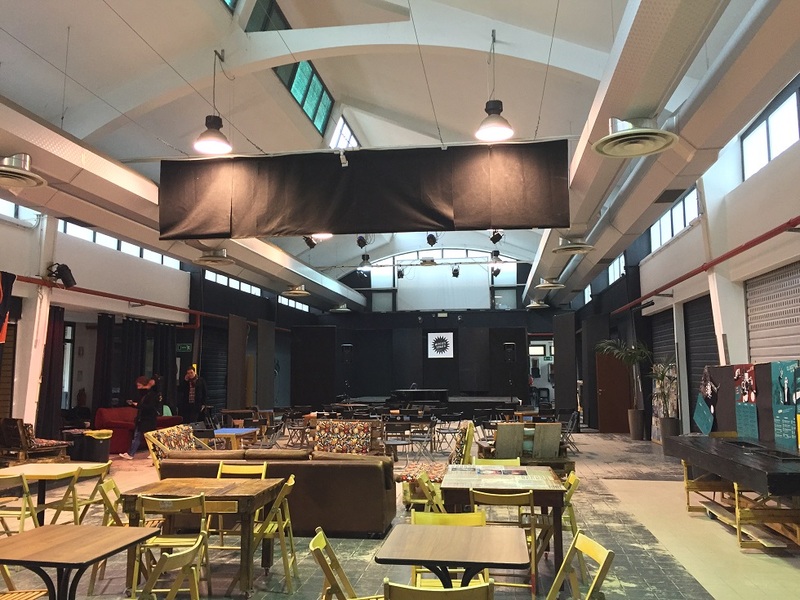 It was developed by an association of musicians in need of a rehearsal space for their orchestra, and it soon evolved into a multimodal hub for music and performative arts. Involving many associations whose work ranges from music to arts and crafts, Mercato Sonato now hosts a variety of music schools, choirs and crafts courses, besides its daily musical evenings. How did your project develop? You can better understand this place by knowing the history of the association that manages it. I am Matteo Parmeggiani, Vice President of Orchestra Senzaspine (No Plugs), an association founded in 2013 by my colleague Tommaso Ussardi, President and me. We are both music directors, and our aim was to create and lead a symphonic orchestra. We studied together at the Conservatory, and in 2013, we established this orchestra. We had just finished school, and we couldn’t find a job or other opportunities. We were not the only ones in this situation: performing and showing their skills was hard for many instrumentalists, let alone working in their field. Many of us felt that our music knowledge wasn’t of any use to society. School had been very hard, and we did not want to feel useless, so we founded an orchestra. We were all young, most of us had just finished school and this turned out to be an advantage. We somehow caught the public attention and support thanks to our informal approach. Soon enough we were ready to found an association based on a manifesto outlining our aims. Our goal is to bring art and classical music closer to the people. We want to show that arts do not bite and people can get closer without getting hurt. We can help those who are not familiar with theatre and classical music, introducing them to this world and making them ask for more, as we would like these art forms to be accessible for everyone, and not just for the elite. The association grew bigger, and we started renting theatres and organized concerts. Our activities became viable and the tickets number sold kept increasing also because at the beginning we were asking for low prices. During our first years, we mainly focused on spreading the word about our initiative, reinvesting almost the whole income in advertisement. How did you move into this space and regenerate it? At one point we felt the need to have our own place where to rehearse, but we eventually realised that we could perform a wider range of activities if we had our own venue. Because in the past we had mingled different arts during our shows – music, dance, visual performance – we were keen on bringing this artistic approach on a permanent term to Bologna. 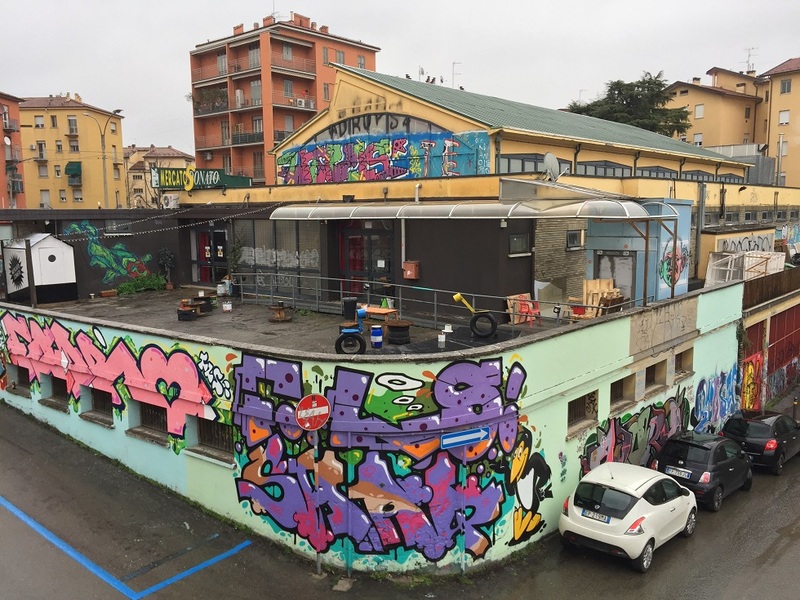 Being selected for the Incredibol fund by the Municipality of Bologna in 2015, allowed us to reach our aim and it even exceeded our expectations and many new ideas arose from the place. Those who win this grant do not receive money, but the Municipality grants them a space to use and regenerate. At first, the Municipality proposed us to regenerate an office building, and even though it was a nice idea, it did not satisfy our need of a space big enough to accommodate an orchestra which counts up to eighty members. Then, they showed us this marketplace, empty at that time, except for one stall that kept working until the end of 2017. The surrounding area was also going through a hard time, experiencing growing micro-criminality and drug abuse. This area is not structurally degraded, and it is close to the city centre. Such a big and peculiar space has also the potential for other activities than an orchestra. What activities do you have in Mercato Sonato? We launched a three-phase project, which we metaphorically called sowing, sprout, and bloom. We asked the district’s residents for suggestions of what other activities to perform in this space, keeping in mind that every activity had to be viable. We arrived here in September 2015, and it took us about one year to reorganize it and to understand how to become cultural managers rather than only musicians. We started organizing events already from the end of 2015. At first, we focused on classical music because this was our area of expertise and because we wanted to learn how our usual audience would react to this very unusual venue. We then opened towards other music styles and we encountered other audiences and targets such as university students, for example. In September 2016 we inaugurated our first season with scheduled events from October to May. We realized that summer months are too hot and few people would come. We have also concluded that Mercato Sonato could become a huge container which could be filled with activities coming from all the associations and informal groups we are collaborating with. For our second season, we choose different genres for each day of the week. The most attended events are the ones happening at night, but we have also proposed daytime activities. We have events every night from Tuesday till Sunday: Tuesday nights are swing nights, on Wednesdays we have a classical music series called “Classica da Mercato,” Thursday nights are for tango, Friday is “Istantanea” (contemporary, electronic music mixing pop, jazz and other influences), while Saturday nights are dedicated to live music. Sunday are days perfect for families: “Mercato di tutti” (Market for Everyone) proposes several daytime workshops for children focused on music and arts, there is a second-hand and handicraft market – there are also puppeteers and a part of our orchestra is also always present, to allow children to get closer to music. We also have a bar and even a kitchen serving vegetarian food made from local products. We are closed to the public on Mondays, but we still work inside. Starting from 2018, we launched a music school for kids. There are classes every afternoon from Tuesday till Friday and two Saturdays per month there is a rehearsal of the kids’ orchestra for students of 6 to 13 years old. Unlike most other music schools, we have a lot of space at our disposal, so we can simultaneously have private or small classes and an orchestra rehearsal. All Mercato Sonato’s spaces are shared, and this gives kids the chance to see grown-ups, including their teachers, rehearse: it is a great educational added value! We do not only teach kids: on early evenings during the week, we also teach music to grown-ups at all levels. We set up a choir called “Coro di Stonati” (Off-key Choir). It is a huge success, it now counts 150 members, and most of them are on the pitch, they just didn’t know it. Mercato Sonato is not only about music. We collaborate with LAC Scatola, a handicraft association that uses some of our spaces to organize tailoring courses using second-hand fabrics, a silk-screen printing workshop, and a carpenter’s workshop. They also design the costumes for our theatrical productions while another association uses a part of our basement for photography classes and darkroom. The aim of Orchestra Senzaspine is to bring music and arts closer to the people, and a marketplace is a perfect setting. We hope to bring back the people who once came here to do their shopping and re-experience the space. In time our community grew a lot: Orchestra Senzaspine now counts above 450 members scattered across the country, thanks to the several years of activity in different cities. 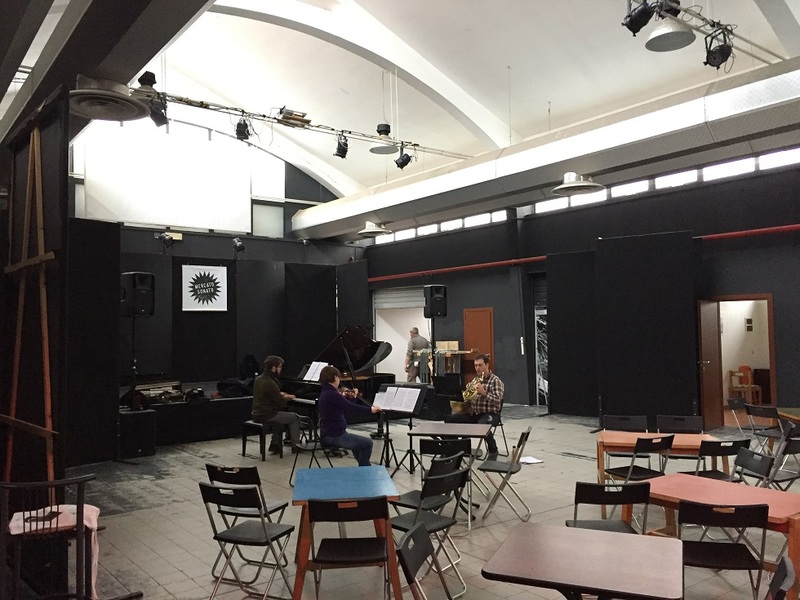 After graduation, musicians struggle with finding a space to rehearse, so lots of local musicians come here to practice, and this keeps the place alive. The venue is a property of the Municipality. What kind of agreement do you have with them, and how do you work together with the other associations with which you share the place? We have a temporary renewable lease lasting for four years – our term is until the end of 2019. This lease allows us to rent space and to sustain our expenses. We are affiliated with ARCI (Italian Social and Cultural Clubs Association) and all participants to activities need a yearly ARCI subscription. ARCI affiliation is common in Bologna and is widespread throughout the whole country, so it doesn’t limit our capacity of attracting and expanding an audience. With bigger, structural improvements we can extend the lease in proportion with the investment we made. Although we are the only ones paying for eventual renovation/improvement and our expenses also include utilities, maintenance, and minor improvements, the Municipality may still publish a new tender to use the building at the end of 2019. Most of the income comes from the bar and from the entrance fees of events. We also get a percentage on the course subscriptions, but we don’t ask for any rental fee from the associations who use our spaces, except for Swing and Tango schools on Tuesdays and Thursday nights. The percentage we get from the courses does not sustain our expenses, but we see it as a contribution. Over 25 people work here. Tommaso Ussardi and I are President and Vice President while Luca Cantelli is the general secretary, and he also manages applications for funding. Both the orchestra and the market area have two official representatives and one secretary who all report to one general administrator. A few people manage both the bar and the kitchen while others work for the associations that organize courses and activities. We also have a press agent and a person who manages relations with schools. Our music school has 5 teachers, we also have a sound technician who assists us before every event. In the following months, we will also work on fundraising and we will strengthen our relations with theatres to promote our shows. What type of funds did you access to implement this project? We won the Incredibol competition that granted us this venue and we have also applied for funding through the Culturability grant, a program focusing on urban regeneration. This program helped us develop a precise plan for the regeneration of this venue so that even before receiving the funds and starting the renovation we have already set many aspects and steps to follow. We were granted €40.000, it was a crucial investment we used to renovate and repair parts of the building. How do other music institutions see you? At first, we had no contact with the Municipal Theatre. We didn’t feel like we could ever compete with them as we saw ourselves as a group of friends playing. But we later discovered that the Municipal Theatre was seeing us as a potential competitor and this made our relations cold at the beginning. As soon as we grew, we felt the need to talk with bigger institutions and to open the opportunity for cooperation. All went well, and we started collaborating. In the beginning, we involved the musicians – some of them play with us and some others are now teachers at our music school – later we contacted the institution itself, proposing opportunities that could be useful for both. In November 2017, we developed a first official collaboration called Elisir d’Amore: they lent us lights and costumes, we featured singers studying at the Opera School and started a promotion granting ticket discounts for the Municipal Theatre. We also collaborate with the Conservatory and our orchestra became part of their didactics. Many of us were students at the Conservatory of Bologna, and we are happy to be now considered as their partners. The Municipality has been supportive throughout the year and we collaborate with the city of Bologna on some big events every year. How do you see the future of Orchestra Senzaspine? We have big plans: we would love to repeat some of these projects somewhere else, and we are now searching for other places to regenerate or new projects we contribute to. We recently went to Milan and discussed the expansions of this project with an investment bank. Classical music can regenerate abandoned spaces and degraded areas, this is exactly what happened here! The Municipality of Bologna will soon start a bigger regeneration program called PON Metro, and it has already allocated about €2 million for the renovation of Mercato Sonato. Works will begin during 2019 and by 2020 the whole structure will be upgraded. Bologna, Community, Culture, education , civic space, commons, community, culture, education, market, municipality, temporary use.